Now, let’s talk about animal law. Asian elephants are endangered. Elephants in circuses are brutally mistreated. 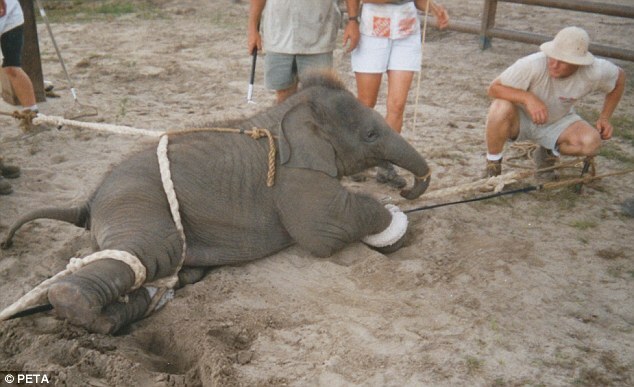 In 2000, a lawsuit was brought under the Endangered Species Act, claiming that the elephants’ treatment by Feld Entertainment (parent of Ringling Brothers) violated the “No Take” provision of the ESA and should be enjoined. In late 2009, following a lengthy litigation, a judge threw out the case after deciding that the former circus worker who was the lead plaintiff lacked credibility, was paid for his testimony, and that there was therefore no standing for the plaintiffs to sue. The decision was a travesty on many levels (some of which I’ve blogged about elsewhere). Perhaps most disturbing was the fact that the treatment of the elephants became wholly ancillary to a ridiculous debate about people. Now things have gotten even worse. Feld has won a ruling seeking attorneys fees from the animal advocacy groups who sued. Feld claims those fees approach $20 million. Among those responsible are several members of the legal team that represented the advocacy groups, including the public interest/animal law firm of Meyer Glitzenstein & Crystal. There is nothing here that is good. The court’s failure to reach the merits of the case essentially granted Feld and similar operations a license to continue mistreating animals. Now, the same judge has penalized those who brought the case, basing his ruling on a deeply flawed assessment of their motives and actions. I have followed this case for years. In my opinion, it was rock solid and ethically prosecuted. I also know personally a number of the lawyers who litigated it. They are outstanding attorneys. Both of these rulings dishonor the legal system. These are bad times indeed for animals and for those of us who care about them. Henceforth, when students ask me whether they should go into animal law, I’m going to answer that they should by all means do it — until the money’s gone. I watched some of the Feld trial and was, like many of the other attorneys watching, amazed and chagrined at the outcome and the ensuing legal aftermath. There are many, many photos and videos documenting the abuse elephants and other exotic animals take under Feld Entertainment’s auspices of “preserving history and family entertainment” by making these species do unnatural tricks before little children. It’s infuriating. Particularly when I find logical, practical, and emotional arguments for parents who nevertheless consistently bring their young ones to see this animal travesty, saying “(insert whine here) I didn’t see any mistreatment” (of course not, not on stage, not in the public’s eye. Don’t these misled people know anything about entertainment? )–that’s the kind of ostrichlike attitude that makes me thankful for articles like this. Thank you! “A dishonored legal system” – That’s certainly an understatement. Sadly there’s not much in this sham of justice that isn’t corrupted. If you’re not “too big to fail” or part of the pin-stripe Mafia… The blind lady holding the scales doesn’t work for you. This is too morally hideous for words. The state is little more than organized barbarism. Corporate might fortified by entrenched speciesism is vastly more powerful than the weak reeds of principle and truth. Those who fought in behalf of the circus’ victims are true heroes. One has to hope against hope that this grotesque injustice will somehow be reversed. David, your link on the words “brutally mistreated” has been hijacked by some kind of soft-core exploitative site. I didn’t stay on it long enough to see quite what it was, but I thought you would want to know! Thanks! I deleted the link. The following is from an email sent by Animal Defenders International. Americans should in particular go to their site to email their government about denying a licence renewal to a horrendous rent-an-animal outfit. ADI is magnificent. “Today, the British Government announced a ban on the use of wild animals in circuses, to be introduced by December 1, 2015. Following a 25-year campaign and many promises, the campaign has been driven by the evidence ADI has collected during our investigations of British circuses. It has been a long hard road, but we lobbied and kept putting out investigations exposing the cruel reality for animals in the circus. We kept the issue on the political agenda. ADI argued that it is not just the incidents of violence, but the constant travel in lightweight, mobile and collapsible facilities, traveling circuses simply cannot provide the facilities the animals need to maintain physical and psychological health. The deprivation can cause greater suffering than the beatings. It is not the end of the road yet – it is a Government Bill and so likely to be voted through, but we have to fight off any attempts to derail it. In Colombia this week, a Bill to ban the use of all animals in circuses goes before their Senate, having been voted through Colombia’s House of Representatives. ADI is campaigning intensely to the last to make this a reality for animals. IT IS TIME FOR THE U.S. to move on this! ADI is determined to take us there!